Classification and Historical Notes: Husk tomatoes have light-brown, papery husks (calyxes) that enlarge and cover the maturing fruits. The 2 most common cultivated species are the ground cherry and the tomatillo. Both have been cultivated in Central and South America for centuries, before even tomatoes. Ground cherries are so named because the cherry-sized fruits are borne near the ground. The leaves of ground cherries are hairy or fuzzy and the plants grow 1-2 ft. tall with lateral spreading growth. Tomatillos are larger-fruited, typically 1-3 in. diameter, and the plants grow 2-5 ft. tall with smooth leaves. Some varieties may grow 8 ft. or more with a ground-hugging growth habit. The Spanish name tomatillo is derived from the Indian name "tomatl." How to Grow: Growing husk tomatoes is similar to Growing Tomatoes. Ground cherries need no support, but tomatillos are best caged or trellised. Harvest: Husk tomatoes usually do not ripen fully until after falling from the plant. Larger tomatillos need to get pulled from the plants. Ground cherries ripen from green to yellow-gold. Most tomatillos ripen from green to yellow-green to pale yellow. Fruit Set: Most cultivars of ground cherry set fruit in all areas of the U.S. Tomatillos are more sensitive to heat and day length: Some cultivars may not set fruit until late summer, or may not set fruit in northern states. Cooking & Using: Ground cherries are eaten fresh, or are used in desserts, sauces, preserves, fruit toppings, pies and salads. Tomatillos are usually cooked to bring out full flavor: Simmer for 5-10 minutes in a pot of water, then use in chili rellenos, salsa verde, guacamole, or other sauces or dips. 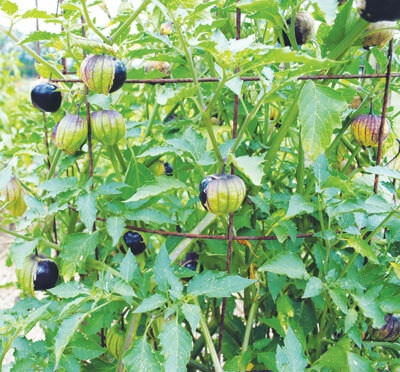 Seed Savers: Husk tomatoes self-sow easily. Isolate varieties by 300 ft. for pure seed.